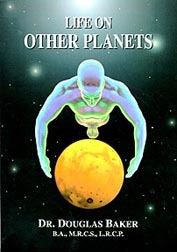 Dr. Baker's occult investigations, together with his knowledge of the cutting edge of contemporary thought, have uncovered fascinating details of the history of our planetary neighbors. Life on the Moon reached fairly advanced levels of physical expression, and evidence for this contention lies waiting to be discovered, at deep subterranean levels. A greater question mark exists over the possibility of complex life having been present on Mars. The discovery of the remnants of microbial life on an ancient Martian meteorite will do little to resolve this quandary. A few drops do not make a monsoon...but they may presage one! This book will change the way you think about life and the universe. It will provide glimpses of the true destiny of humanity.... Immortality! Contents Copyright ©1997, Douglas Baker. All Rights Reserved.